Fried Egg Sandwich before closing it. Eggs are very interesting things. They are literally the stuff of life. From human eggs to chicken eggs to ant and bee eggs, it's from eggs that life of many creatures in the animal kingdom spring. Eggs are very involved in cultural images, especially those relating to spring and fertility, from coloured Easter Eggs to the eggs present in many ancient and antiquitous fertility rites in the spring as planting begins. They are present in other contexts, from egg sacrifices in Hawaii to their use in Feri Kala rites. And let us not forget that eggs are synonymous with breakfast for many of us. Eggs have so many uses, they are a most in many kitchens. Think of all the things that require them. Many breads and pastries require eggs. Chinese fried rice includes egg, as does egg drop soup. Mayonnaise can't be made without eggs and still be mayonnaise. Many cookies and frostings require eggs. In Mexican cooking, you find hueves rancheros. Stroganoff uses egg noodles and some wheat based pastas include egg in their ingredients. Many casseroles use egg. We find eggs in all parts of the menu from salads and soup, to appetizers, to main courses, to deserts. List all the ways to prepare eggs themselves. Fried, poached, boiled, scrambled, basted, shirred. And all the ways to do each of those? Fried eggs can be over easy, over hard, sunny side up, and many others. Boiled eggs range in degrees between soft and hard. Omelets are very similar to scrambled eggs in how they are made, but are smoothed out instead of made to bunch up. And what do you add to the eggs when cooking them? Salt? Black pepper? White pepper? Cayenne pepper? Parsley? Tarragon? Celantro? Sage? Butter? Olive oil? Garlic? Onions? Peppers? Tomatoes? Bacon? Sausage? Ham? Steak? Mushrooms? Paprika? Chili powder? Flour? Sugar? Milk? The possibilities are endless. And what about sauces over the top when you're done? A cream sauce? Hollandaise sauce? Salsa? Tabasco sauce? Gravy? Ketchup? Mustard sauce? Red wine sauce? Garlic sauce? Ranchero sauce? Soy sauce? I have some favourites when it comes to eggs. I remember as a kid going to a restaurant each morning for breakfast when we first moved to Oregon. We were staying in a hotel until we could find somewhere to live, and the restaurant was right across the street. I ordered a breakfast that included eggs and the waitress asked me how I wanted them cooked. I said hard boiled. Now, hard boiled isn't a way eggs are made at restaurants. They cook them on the grill, so boiling isn't really an option unless they are prepared for it. She felt bad telling me no, but the next morning she kept an egg when they made them for their salad bar and I got a hard boiled egg each morning. She delighted in doing that for me. And I was all smiles and joy. At home some Sunday mornings, my mom would make soft boiled eggs. She'd boil them and shell them and put them on our plates, and we'd add butter and salt and pepper and we'd break up saltine crackers and mix them in. It was one of my favourite breakfasts. My mom cooked hers separate, because we had the yolk mostly hard but she liked hers runny, so she pulled hers out first and just added butter and salt, no crackers or pepper. I loved my eggs sunny side up when they were fried as a kid. Well, loved them when my mom made them. I loved the colour, the bright yellow contrasted with the pure white. I was a very sensual child and anything that pleased my senses made things that much better. I also liked how thin the membrane was over the yolk. I'd take a piece of toast and break the yolk with it and dab it up, then each the white and bottom of the yolk with a fork. I loved that liquid yolk on toast. But restaurants were different. When they cooked sunny side up, without fail, the white would still be liquidy on top, and nasty. So I usually order over easy in restaurants, not what I wanted of course, the membrane was too tough and the yolk was often too solid, but better than liquid white. When I got to college, they had in the school cafeteria a station where a cook made eggs to your liking during breakfast time. I got over easy, and often talked to him while he made it. One time I mentioned that I liked sunny side up but people always had liquid white so I don't order it. He told me the secret is a bit of water and a lid. He made sunny side up for me each morning after that. What he did was crack it and fry it normal until the bottom was close, the spritz it with a bit of water and put a frying pan lid over it on the grill for a bit. It came out perfect. My sister always loved scrambled eggs. I loved hers, which turned out just the right texture and turned out white for some reason even though she included the yolk. But more scrambled eggs have a texture that reminds me of uncooked egg white for some reason, so I typically avoid them. Same issue with omelettes. I love the tastes, but most omelettes are too runny for my liking. But when I make my own on rare occasions, I can get the texture right. 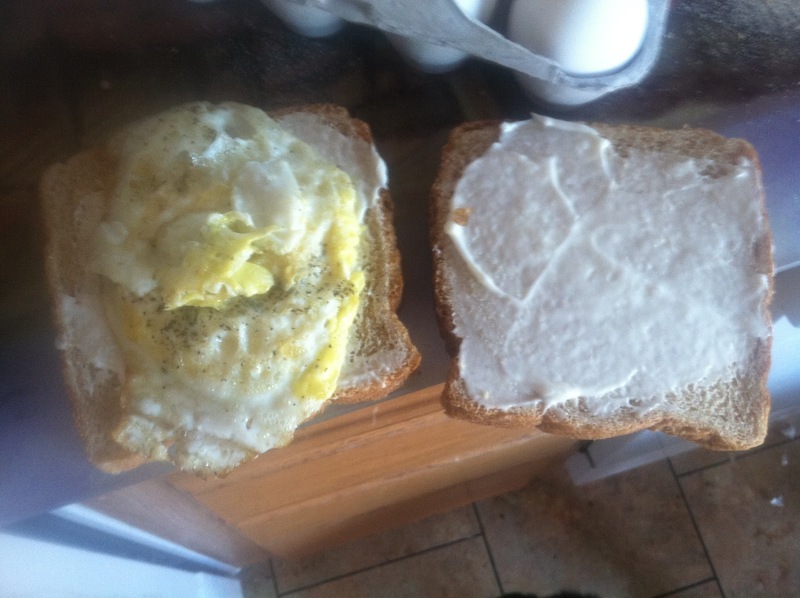 When I was first on my own and was in an apartment with a stove, I started making myself fried egg sandwiches. I had had them a few times as a kid, but seldom. I had no idea how to make them, so I just fudged it. And succeeded. They aren't hard to make. Fry an egg, same way as over easy, but break the yolk at the beginning. I fry it in olive oil because I love olive oil. I fry it on one side, flip it over, sprinkle it with salt and pepper, and sometimes tarragon, flip it over again, more salt, pepper, tarragon, flip it again. I don't toast the bread because I like it soft. 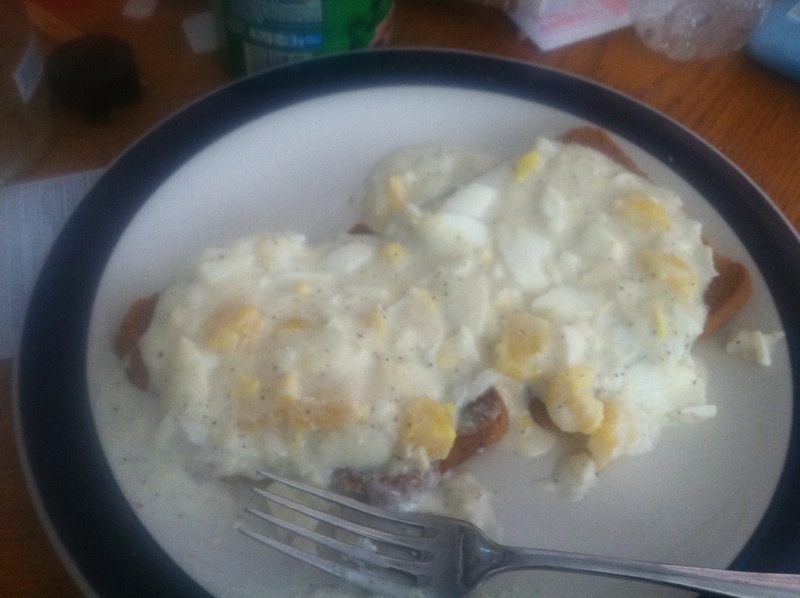 Take two slices, spread mayonnaise on each, toss the fried egg onto out side, flip the other side over, and eat. Takes less than five minutes to make, and I can eat it moving around the house if I want. Fast, cheap, easy, delicious, and simple breakfast. When I was older, I decided to make banana bread. I'm bad at following recipes, and baking is a bit hard without one, so I looked at ten or fifteen recipes online and determined I could make it with five simple steps: put everything into a bowl, mix it up, pour it into pans, cook, remove from pans. Simple. I go the proportions down in an easy math formula my brain could handle and I could easily reduce or increase. For every two bananas, four cups of flour, two eggs, two teaspoons of baking soda, a half teaspoons of salt, a half cup of sugar, one stick of butter. Worked great and turned out delicious. I made it every Thursday evening for a while, then ate it and shared it in between. I typically made three small loafs and two pans of muffins. And two bananas are two cups, so if you use another wet fruit or vegetable, you can use the same proportions. I made strawberry bread one week, apricot bread another, and a mixed berry bread one week. Of course, this is at 7220 feet above sea level. It might not work the same lower. One meal my mom made once in a while growing up was creamed eggs on toast. I loved it, but never thought of it when I was thinking of things to make. When I thought about it, I thought it would be difficult, so never looked it up. I was getting eggs for fried egg sandwiches last week and it crossed my mind, so I looked up a recipe on my phone. It was very simple and was all things I was going to buy anyway, so I decided to give it a shot. First step, soft boil the eggs. You put them in a sauce pan, cover them with water, raise it to a boil, immediately take it off the burner and heat, cover it, and let it sit in the hot water for ten minutes (at my elevation anyway). Once it's sat for ten minutes, drain the water, run them under cold water to cool them and/or let them sit to cool. I found one egg per slice of toast to be perfect. Two eggs and two pieces of toast is the right size breakfast for me for creamed eggs on toast. After the eggs arfe cool, peel them, making sure you get all the shell, then cut them up with a shark kitchen knife. You want small pieces. They will be kind of crumbly in a moist type of way. Probably about quarter inch pieces is good. Now melt butter in the sauce pan. The recipe called for one teaspoon per egg, but I used on tablespoon for two eggs, which is three teaspoons. I melt it at 4 on my stove settings. High is 10. Once it's melted, add two teaspoons of flour (one teaspoon per egg) in a mound in the middle, then pour 2/3 cups of milk (1/3 cup per egg) over it. I use whole milk. I then mix it all together into a sauce with a wooden spoon, raise the temperature to the 7 setting, and wait for it to reach a boil, stirring it a lot. I then dump the eggs in, sprinkle in probably three shakes of a salt shaker and sprinkle in pepper enough to look the way I think it should look. I stir it all, let it cook for a minute or two, then pull it off the burner onto another one, and set that on low to keep it warm. I then toast two pieces (or however many) of wheat bread on a cookie sheet in the oven, with the oven on high broil. Once it's fairly dark brown, I pull it out and pour the creamed eggs over them, and eat. Very yummy. There are no ends to the ways to cook and prepare eggs, and they truly are magical.